I suppose it's inevitable that if one concentrates on plants in one's immediate area, the same will come up over and over. 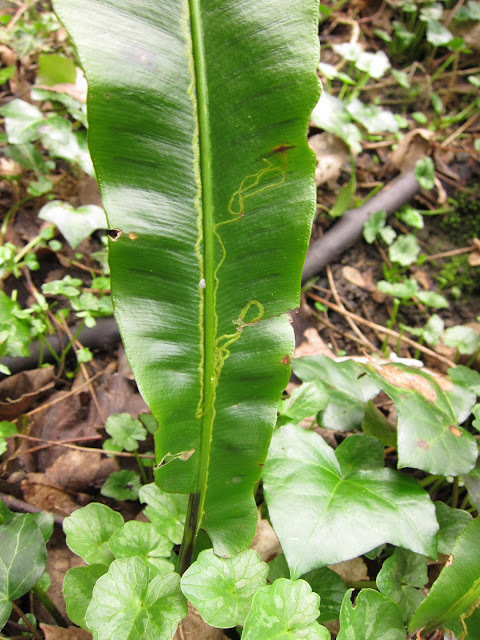 So it is, with Hart's Tongue Fern - Asplenium scolopendrium. I don't mind. I like it a lot and feel privileged to live somewhere where it grows out of the ground, out of walls and in drains! This one is within a few feet of the tree we are following. It's not the most beautiful of specimens - but all the Hart's Tongues in these woods are looking pretty tatty. It's not their 'moment'. But there's more to see than the whole plant. Move in - a leaf. 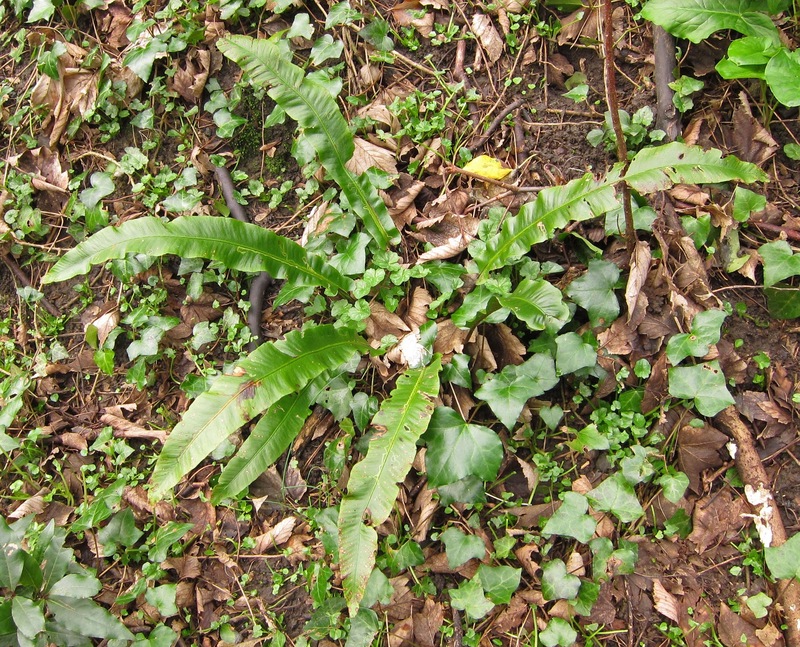 A couple of hundred yards away, we find a clump of Arum maculatum - except these, despite their name - are immaculate; their inky spots are missing. Still beautiful though. And behind them, a short log with small, round fungi; the largest a little more than an inch across - Auricularia auricula-judae - Jew's Ear Fungus. (Often known as 'Jelly Ear' too.) Looking this up on the internet I find a suggestion that the name is a corruption of 'Judas' Ear'. 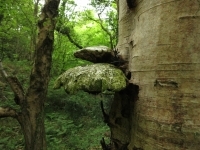 Apparently there's a tradition that Judas hanged himself from an Elder Tree and this fungus is often found on elders. In this case it's on a piece of dead wood; probably sycamore. 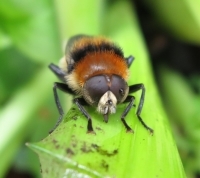 The individuals remind me of small, smooth, orange satellite dishes but I've seen others that are more crimped at the base so the inner shape is more ear-like. Another couple of hundred yards and a large log, left here since a tree was felled more than a year ago. And, on it, long, thin ribbons of fungus, protruding about a quarter of an inch (and less . . . but maybe they will grow?) from the log. And out of the woods, exposed to the winds and sea air (and, incidentally, on an elder tree) - Common Orange Lichen (Xanthoria parietina ). It's good to walk through the woods - and these are easily accessible. What's more, everything in this post is within a twenty minute walk. It's good to look up and around, of course. And if you are in a hurry, that's what you will automatically do. But the longer you linger, the closer you look, there's much more than twenty minutes in the detail! Splendid macros! Very much an ear! Beautiful lichen - that's my favourite! More people should take this sort of interest in their immediate surroundings! 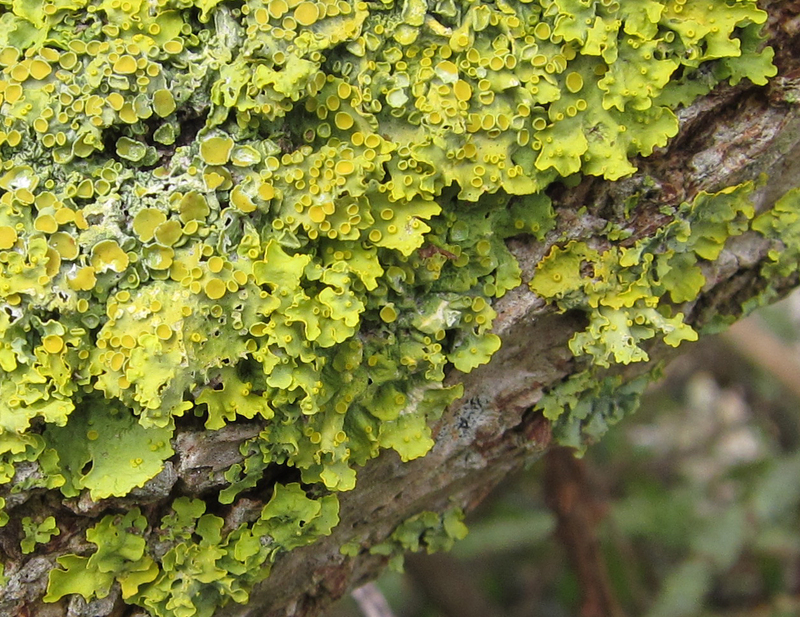 A superficial look often misses some things of great beauty - like those lichens. I love fungi, moss and lichen, though rarely manage to take decent photos of them. Love the macros of the leaf miner's progress. I'm longing for a couple of dry days - we have some wonderful woods nearby, but they are very boggy. Walking in them right now would be verging on the impossible, and would almost certainly lead to welly loss in the gloop! Your post is such an informative post!! I really like your efforts..You did a great Job! :) keep it up! Thanks for sharing all these wonders of nature that most people would likely just tromp over. Loving the alien lichen and the scarlet fungi--you can really see how these "mushrooms" are eating away at the logs. Very pretty! I'm always looking around me for new and interesting things in nature though we don't have any arum or harts ferns growing wild here though I grow the fern in my japanese garden. Those lichen always remind me of moon craters. Have you found any rosa canina galls on your travels in the area? I'm watching one from last autumn and waiting for those little wasps to soon hatch out. I thoroughly enjoyed this post Lucy. 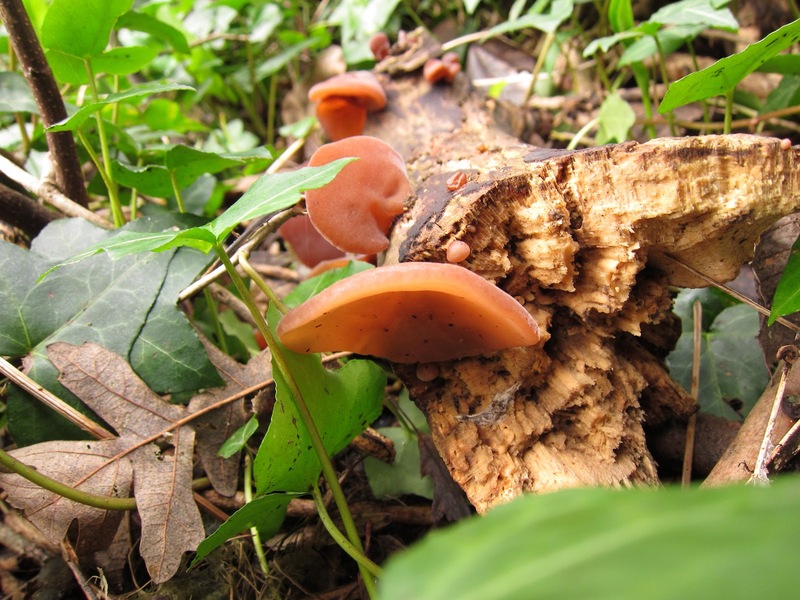 I was Interested to read more about the 'Jew's Ear' fungus and how the name may have arisen. I came across this in my own garden last year ~ a most fascinating creation. I'm glad to see some one so fascinated with all of the subtle details of what surrounds us. Those long ribbons of fungi look like turkey tails to me. At least from the photo. Good in soups. Hello Mag - glad you see the 'earness' of the fungus. Hello Alan - I enjoy taking photographs of lichen. It is pretty amazing to the naked eye but amplified by the camera lens it's extraordinariness and beauty is amplified and emphasised. Hello Mark - one of the special things about rarely travelling a great distance from home, one has to look down and in detail rather than far away. I'm glad you found the post interesting, Rowan. I was specially glad to find the Jelly Ear, not only because it is beautiful but because, until now, most of the fungi I've noticed round here have been autumn ones. Hello Plantalicious. We haven't had rain for ages. (I'm writing this on 12th March.) If your area is the same as ours, I expect your woods are opening themselves up once more to exploration. Hello Blog reader with an http for a name (!). I'm glad you enjoyed your visit. Hello Phyte Club Katie - Something which will interest me is whether these same fungi will be there next year. I haven't noticed any galls on the wild roses, Leaves 'n Bloom but there were some on a nearby Turkey Oak last autumn. We'll have to see if they are there this year too. Hello Anna. Were you pleased to see the fungus in your garden or, however pretty it is, did you regret its presence? Hello Forest Keeper. I don't think these ribbons of fungus are Turkey Tails because they are very narrow and thin and have been that way for a while. Of course, they may have had a sudden spurt but do Turkey Tails not come with rounded edges?